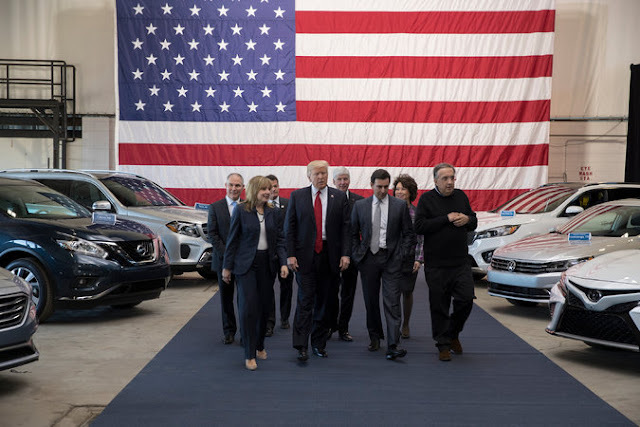 In the wake of the Trump administration’s rollback of clean car standards, Public Citizen has launched a four-week digital ad buy calling on Ford, Toyota and General Motors to stop undermining fuel economy and greenhouse gas emissions rules. The administration last week delivered automakers their long-requested rollback of clean car standards – a policy U-turn that would cost consumers billions at the gas pump and dump billions of tons of harmful climate pollution into the atmosphere. The three companies have lobbied behind the scenes for the standards to be weakened. The online ads feature images or animations of a polluting tailpipe, as well as parodies of automakers’ taglines to highlight their opposition to clean car standards. View the ads here. The clean car standards were put in place by President Barack Obama, and at a 2011 Rose Garden ceremony, automakers agreed to follow them. But as soon as President Donald Trump took office, automakers rushed to lobby for the rules to be dismantled. The standards would double fuel efficiency by 2025 and reduce the amount of climate pollution emitted over the lifetime of vehicles sold between model years 2017 and 2025 by 6 billion metric tons – the equivalent of a year’s worth of pollution from 150 power plants.